This past St. Patrick’s Day (2013), dancers from the Shamrock Dance Company of Vienna surprise an unsuspecting audience, as you can see by the looks on their faces. St. Patrick's Day Wien Flashmob 2013. 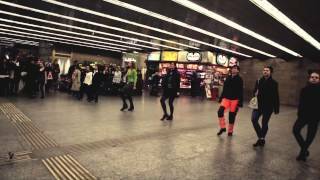 Added: March 12, 2013 (about 1 year ago) Duration (3:52) Views: 87,292 by StPatricksDay Wien Category: People. Download St Patricks Day 2011 - Riverdance Flashmob (Central Station, Sydney, Australia) video and mp3 music songs.